There's some flyweight action this weekend as Luis Concepcion and Odilon Zaleta touch gloves in a bid to capture the WBC Latino flyweight title. The two head a fightcard held at the Roberto Duran Arena in Panama City, a place where Concepcion finds the bulk of his fanbase. We last saw Concepcion losing out to Hernan Marquez in the first round, after Concepcion went down three times. This lost him the chance to take back the WBA title that Marquez had prised from him only six months earlier. On the face of it, three knockdowns in the opening round would point to a couple of mismatched opponents and indicating that Concepcion was out of his depth, but just half a year earlier the two fought in a fight of the year candidate where both men were knocked down. His two losses to Marquez shook him, and Concepcion finds himself trying to renew his reputation. 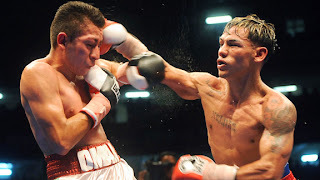 He's already picked up his first win Oscar Gallardo, scoring a first round KO of his own this time, and his fight with Zaleta is another carefully picked bout designed to put his confidence in a booster seat. Zaleta, if he subscribes to our blog, won't be happy to read that, but it's the truth. Zaleta is certainly going to come to win, but despite having a decent 11-1 record he just hasn't fought anyone nearing Concepcion's standard. Once criticism of Zaleta is that he has a tendency to retreat into a defensive shell, backing away from his opponents and giving them control of the ring. Against someone like Conception that is downright dangerous, and for that reason I think Conception gets an early KO in this one. Who do you think will win? Join our prediction league and let us know.